FREE Kaleidonotes study guide for music class (includes Matching Game Activity). 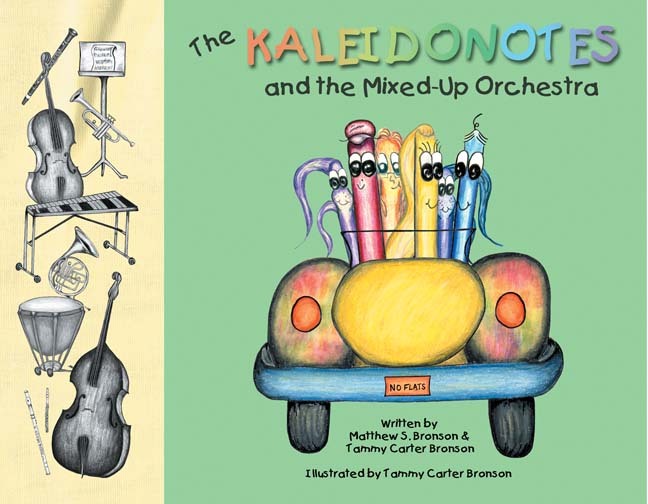 BOOK SUMMARY: The Kaleidonotes help the confused instruments of the orchestra find their places on stage so the show can go on! A fun rhyming story that teaches instrument families and their places on stage. VIDEOS: Watch the pages turn as Tammy reads her second picture book! I have a question, why did you call your book The Kaledonotes? I am often asked many questions about this book, so I created a blog post that gives more information about the book. Here is the answer to your question, “Where did the name ‘Kaleidonotes’ come from? ‘Kalos’ is Greek for ‘beautiful’, and ‘eidos’ is Greek for ‘form’. So the name ‘Kaleidonotes’ means ‘beautifully formed’ notes! When my husband and I made the book (2000-2001), we enjoyed creating a new, unusual word.